Peace is an element of life, peace on the other hand helps in nation build, on that note As we draw closer to the 2016 elections scheduled for November 7th, the only word left on the mouth of each and every citizens is peace. Today, Friday 17th, June 2016 the Brong Ahafo Regional branch of Ghana's acclaimed music body, musicians union of Ghana (MUSIGA), took to the streets of Sunyani the region's capital to preach peace . The peace walk scheduled by organisers to commence at exactly 6am begun at 8am and had a few number of its participating members chanting and singing along with the musical band. The walk which start on a slow pace due poor organization, picked up gradually as they com the region's capital with plat cards, reading 'Peace we Need', 'MUSIGA for peace','Say no to war' and many more signifying their support for peace and stability before, during and after the elections. 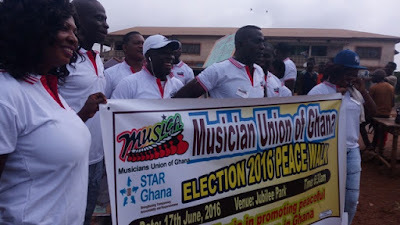 The two (2) hour long walk which had Jubilee park as its kick off point finally ended at Centre for National Culture ( CNC ) with both members and organizers happy about the Initiative and plan to back it with other activities such as a musical concert to help promote peace in Ghana.